Wireless charging could soon become ubiquitous, and here’s another one of the big boys jumping into the fray, Hitachi Maxell. We tested a similar wireless charging system by Energizer, and found it to be reliable and convenient. It uses the same wireless standard as this Hitachi Maxell unit, called Qi (pronounced “chee”), now adopted by 72 companies, encompassing almost every big name in consumer electronics, well, except for Apple. Hitachi Maxell offers a unique choice beyond the Energizer charger we tested last month, giving you either a charging station with two places to charge two separate devices at the same time, or a smaller and cheaper unit that charges a single device. However, it lacks the Energizer’s extra USB port for those other cellphones and music players that, for now, remain sleeveless. I’ve been testing a similar Qi wireless charging system for a while, and think its only weakness is the slightly bulky sleeve into which you must place your iPhone for it to charge wirelessly. However, if this momentum continues, in a couple of years or less, the necessary induction charging wizardry will be built into many portable devices, with no sleeves required. According to Ubergizmo, Hitachi Maxell is not announcing prices for the double charger or its single-charging little brother yet, saying both products will be available in Japan sometime in late April, hopefully with a U.S. debut soon thereafter. 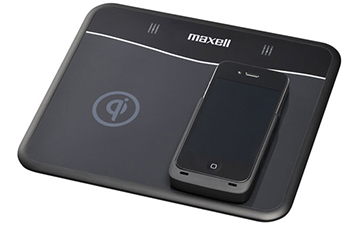 To give you an idea of pricing, its competitor Energizer’s inductive charging station retails for $89, and that iPhone 4 sleeve (which will work with any Qi-compliant charging station) can be found for as little as $25. Is wireless charging worth it? It might seem dumb and lazy to dread plugging in your cellphone, but in reality this wireless charging idea feels like magic. Because of the increased likelihood of my actually using it, my phone hasn’t run out of battery power since I started wireless charging.